What kind of motorcycle ride are you looking for? A great motorcycle ride in the Carson Valley and Lake Tahoe area might be all pavement, or mostly dirt, or a big day of both, depending on what you want. We are very fortunate to be very close to hundreds of miles—thousands, really—of scenic, twisty, uncongested roads. 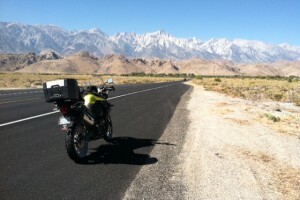 If you are a street rider and new to the area, we suggest heading out for some of the High Sierra passes. Carson Pass, Ebbetts Pass, and Monitor Pass are all within about an hour’s ride of the Carson Valley. Sonora Pass, Tioga Pass, and Donner Pass are all within two hours. A motorcycle ride over five of these great mountain passes in a single day is completely feasible. To do it, you’ll ride hard, return tired, and won’t have a lot of time to stop and see the sights. But you will have one of the best days of your life. If you’re looking for a motorcycle ride on dirt and gravel roads, or technical single-track trails, there’s plenty of that, too. We’re surrounded by vast tracts of public land and huge portions of it are connected with unpaved, off-highway vehicle routes that are legal to ride. (Check with the appropriate land management agency for maps and restrictions.) In the Sierra, most of these areas are managed by the US Forest Service. In western Nevada, you’ll find most of the public land under the control of the US Bureau of Land Management. The Humboldt-Toiyabe National Forest is the largest national forest in the Lower 48 states. The 368,600 acres of the forest’s Carson Ranger District extend along the eastern front of the Sierra Nevada, straddling the Nevada and California state line. The district is about 15 miles wide and near 100 miles long and stretches from northwest of Reno, Nevada, south along the Carson Range between Lake Tahoe and the Carson Valley, then south to Sonora Pass. The district office is right nearby in Carson City. Other national forests in the area are the Eldorado National Forest, the Sierra National Forest, the Tahoe National Forest, the Stanislaus National Forest, and the Lake Tahoe Basin Management Unit. Opportunities for an off-highway motorcycle ride inside the Tahoe Basin are very restricted. Exceptions, such as the Genoa Peak Trail—one of our favorites—and the eastern portion of the Rubicon Trail, can offer some spectacular riding. Most of the other national forests offer a lot of great dirt roads for backcountry adventure. The eastern edge of the Carson Valley is defined by the Pine Nut Mountains with fantastic dirt riding. Wide, maintained main roads with firm dirt and loose gravel surfaces can get you into and across the mountains at surprisingly fast speeds. More technical routes will include steep slopes, deep sand, loose rocks, short sight lines, and some water crossings. 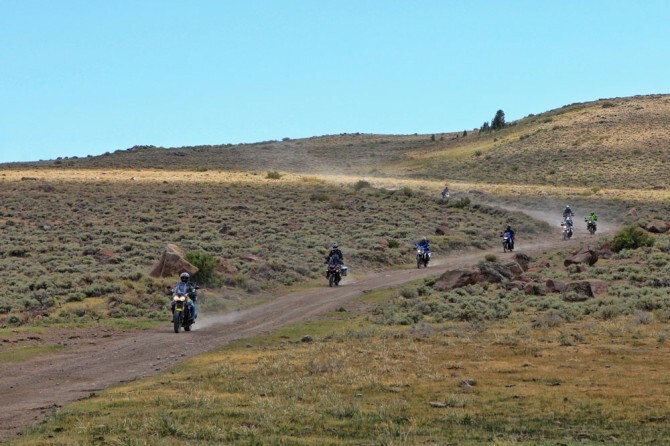 And all of this backcountry adventure is just a short motorcycle ride on paved rural roads from friendly and affordable Carson Valley hotels and restaurants. Backcountry dirt adventure motorcycling in western Nevada. Our area offers a huge variety of great adventure motorcycle rides, however you define that, and whatever type of bike you like to ride. Grab your gear, decide whether you want to ride pavement or dirt, and then ask yourself, “How hard do I want to ride today?” If you need some help figuring all this out, or just want some local advice, sign up for our email newsletter, or c’mon up and ride with us. 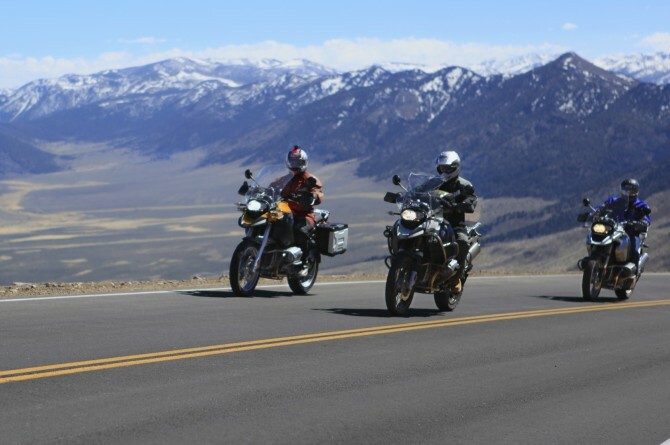 The 2013 Carson Valley / Lake Tahoe Adventure Moto is August 22-25 and you can register here.